2019 Apple Festivals in Pennsylvania - Where, When and More to Find an Apple Festival Near You! Looking for a apple festival in Pennsylvania in 2019? (just scroll down the page)There is no other listing as complete and current as this list, just updated! All the apple festivals in Pennsylvania we can find are listed on this page! If you love strawberries, look for a festival near you below! And I'm always looking for more apple festivals! Please write me, if you know of any to add! I update the dates as soon as the festivals publish their information, but you can always click on the links (usually the name of the festival) to see the current information on the festival's own website. Annual Harvest Festival at Reading Terminal Market - a weekend in mid October from 10am to 4pm. Filbert Street, Philadelphia, PA. They shut down Filbert Street and turn it into an urban farm closed to vehicle traffic. There is authentic farm tractor for a hayride, hot apple cider, Pennsylvania chesses and autumn harvest fruits, vegetables and more. There is also a Market sidewalk sale and live bluegrass music. Phone: (215) 922-2317. Apple Butter Festival - a Saturday in October from 9 am to 4 p.m.
United Church of Christ, 1201 N Chester Road, West Chester. Phone: (610)-692-2951. Food, crafts, candles, furniture sale, used-book sale, more. Franklin, PA. Applefest On-Going Events; or Friday Events; or Saturday Events; or Sunday Events. For more information contact the Franklin Chamber of Commerce at Phone: 814-432-5823 or 888-547-2377. Email: [email protected]. Hickory, Pennsylvania. Phone: (724) 356-FEST. For more information see: Music, Arts/Crafts, Kid's Activities, Food, Directions. Two days of great live music, exceptional arts and crafts, and lots of activities for kids and adults. Look for antique machines and vehicles, cornmeal grinding, chainsaw sculpting, spinning, weaving, quilting, pie eating, apple bobbing, a moonwalk, pony rides, a baby farm animal petting zoo, face and hair painting, clowns, balloon animals, a Native American village, a boy scout encampment, and much more. Don't forget our delicious homemade food, apple pies, dumplings, apple cakes, apple crisp, fresh apples, cider, caramel and candy apples, apple butter, apple syrup, apple pizza, and other apple items. Free General Admission & Free Parking (Limited Handicapped Parking). Free Shuttle Service. No Pets & No Soliciting. South Mountain Fairgrounds, Rt 234, Arendtsville, PA. Phone: (717) 677-9413. Directions: located just 10 miles northwest of Gettysburg.. Celebrating beautiful crafts, great music and wonderful food for forty years. The festival has something for everyone with hundreds of arts and crafts dealers, demonstrations, contests, food stands, and entertainment. The festival is located in the heart of Pennsylvania Apple country, near historic Gettysburg, and is within a two hour drive of Washington DC, Baltimore MD, and Harrisburg PA. .All admission tickets include parking in one of several parking fields and shuttle bus or wagon service to the festival grounds. Also included in admission price is all live entertainment, attractions, exhibits and orchard bus tours. 2018 prices were General (12+) - $10, Seniors (60+) - $9, Military w/ ID - $9 (at gate), ​Two-Day Flex Admission (12+) - $17; Kids under 12 - FREE. Admission may be purchased online or at the gate. Payment methods accepted online: All major credit cards. | Payment methods accepted at the gate: cash or all major credit cards. | Two-Day Flex Admission is valid once per day, on two separate days of the festival in the same year/event. Charter bus rates available. Schedule, General Information, Local Info, History, Traveling In, Map of Grounds, Photo Contest. 545 Carlisle Road, Biglerville, PA 17307. Phone: 717-677-8412. Alternate Phone: 717-677-9494. Fax: 717-677-7157. Email: [email protected]. Open: Please call before coming or check our website. Click here for current open hours, days and dates. Directions: Located nine miles north of Gettysburg right on route 34. Just a short drive from Route 15, Route 30, and Interstate 81. Click here for a map and directions. We use integrated pest management practices. Payment: Cash, Check, Debit cards, Visa/MasterCard, Discover. Click here for our Facebook page. Apple Harvest Festival Weekends - Our bin porch is our claim to fame! Pick from over 20 different varieties during the Apple Harvest Festival weekends! 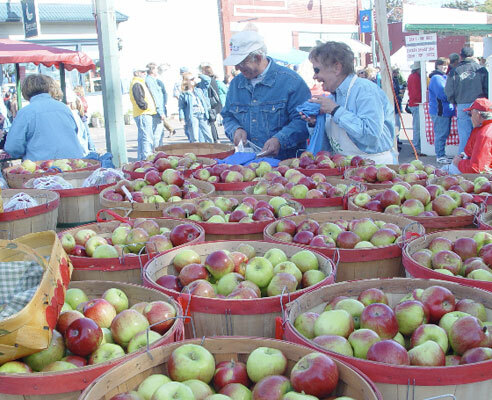 While the main festival takes place at the South Mountain Fairgrounds just a few miles from the farm, no trip to Adams County would be complete without a stop at the market to stock up on all things apple before heading back home! Enjoy the weekends of the National Apple Harvest Festival, then stop by Hollabaugh's for apple variety sampling, gallons of delicious apple cider, fresh apple baked goods (baked in-house), Fall decorations (mums, pumpkins and more) and our NEW Orchard Scavenger Hunt! No trip to Hollabaugh's is complete without shopping on our Bin Porch, where dozens of apple varieties are available in the bins!